"This gem of a book is a great resource to educate, remove some of the fears, and provide hope for anyone faced with living with this disease." Cure JM Foundation funded the first book ever published about Juvenile Myositis: Myositis and You. Co-edited by one of our founders, this comprehensive guide features over 450 pages with contributions from over 80 experts and medical professionals. 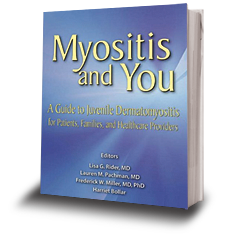 Myositis and You is available as an eBook through amazon.com. Proceeds from the sale of this book will help fund further research into juvenile myositis.